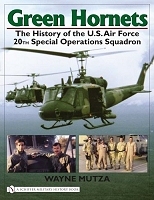 This book is a unit history of the �Green Hornets.� This U.S. Air Force Squadron is unique among Air Force units, and can claim to be the first to operate helicopters. The story of the men and machines starts in 1942 with early activation as the 20th Observation Squadron (light) at Savannah Army Air Field near Savannah, Ga.
After undergoing many activations and deactivations, they finally became the 20th Helicopter Squadron in July 1956. In 1965, it was the first Air Force unit to be deployed to South Viet Nam. The mission was support for U.S. Army Special Forces in South East Asia, and the unit designation was changed once again to the 20th Special Operations Squadron (SOS). Following service in S.E. Asia, the 20th SOS remained in the business of providing support for special operations on a worldwide basis. This has resulted in operations during Desert Shield, Desert Storm and many, many other missions, which cannot be described for security reasons, and which continue into the present. The author has done a great job of telling the story of this unique outfit. The words are interspersed on each page with pictures of the people, places and equipment, involved. This makes for an enjoyable read, and really brings out the valor of these remarkable aviators. There is an excellent picture galley showing every aircraft operated by the Green Hornets, along with pictures of the air and ground crews. Also included is a collection of Patches worn by members of the 20th SOS. A great book, highly recommended.